Say you’re Mary, a woman executive. Clever. Doing well. Rising fast. Ambitious. Self-confident. I can do this! You give a TEDx talk. Fame! It turns out to be like many (most?) TEDx talks. The faux-jokey ‘strong start’. The almost desperate attempt to be NEW and INTERESTING. Over-rehearsed. Contrived. Formulaic. Not-so-subliminally anxious. Someone like me watches it on YouTube for as long as is humanly possible (about 30 seconds). It’s obvious within a few words exactly what’s wrong with it. Tone. Pace. Ideas. It’s also obvious how to start fixing it (both content and delivery) so that next time it’s incomparably better. Perhaps even edging towards amazing. If I contact that person out of the blue to offer suggestions, it’s mansplaining. How dare you?! Mind your own goddam business. I Am Woman. Hear me roar. Or at least make a loud noise. But what if a woman in the audience on the day thinks that *cough* it might be improved here and there, and recommends to Mary that she contact an expert such as myself to lift Mary’s speaking on to the next level? EEEEEEEEEEEEE. How dare you?! Why are women always undermining other women’s confidence??? Don’t you care about SISTERHOOD??? Even Mary’s boss who is likely to be a dull safe speaker too is unlikely to suggest that there’s ‘room for development’. Why bother? Better safe than sorry. In short, Mary is becalmed, somewhere between Not Too Bad and Adequate. She has two problems. She’s not as good as she could be. But (much worse) she has no way to find that out. The world sighs, and moves on. Jane is different. She is invited to address a large distinguished audience. She knows that she can not mess this up. More than that: she wants to be good. She hears of me, and asks me to help. After we negotiate the reassuringly expensive fee, we start to talk. What does Jane think about this occasion and where she fits in to it? What are her own ideas and metaphors? How about, say, playing with Time to give the speech meta-structure: Yesterday –> Tomorrow –> Today? Above all I explore Jane’s willingness to take risks. To be deliberately different. What are they expecting? What are they NOT expecting? What do they want to hear? What do they NOT want to hear? What do they NOT want to hear that you want to tell them? 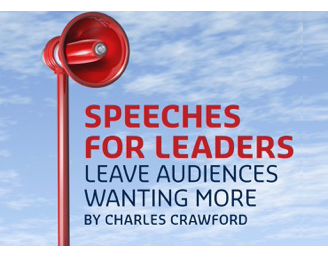 In my book I also look at a speech by George Soros, also on the Eurozone crisis, that is very different in style but no less powerful because, again, he puts his full professional reputation on the line to deliver very tough messages. And, oddly enough, at that point the wise speechwriter steps back and lets the leader decide just how far she or he is willing to go on this occasion. It becomes a very personal choice. Reagan asked Duberstein’s advice. Duberstein replied that he thought the line about tearing down the wall sounded good. That’s the ultimate challenge of speechwriting: helping the speaker truly own and take responsibility for his or her words. Yes! How far is a speaker prepared to take risks? Being the best speaker on the day is a lonely place. Everyone will be staring at you. Other speakers will hate you. But the headhunters in the corner will be cooing and fluttering. On the day Jane and her presentation sound BIG and WISE. And because she sounds big and wise, the audience feels big and wise. Everyone has a good time. Glory. The result, as evidenced by two different Janes whom I recently helped? So many people were coming to congratulate about the speech during dinner that I never got to eat! I had to change my dress to avoid being recognised and getting even more congratulations! How many New York psychoanalysts does it take to change a light-bulb? One – but the light-bulb really has to want to change! This article about women speakers is dead on to a point. It's true that sometimes offering assistance or suggestions (by a man) out of the blue can be disarming and so the defenses come up. Also true, that women sometimes do take offense at another woman's suggestions as well. I think that can happen especially if the female speaker is not confident in herself as well. Love the article and the demonstration. I will be checking back for more on this subject. Thank You.